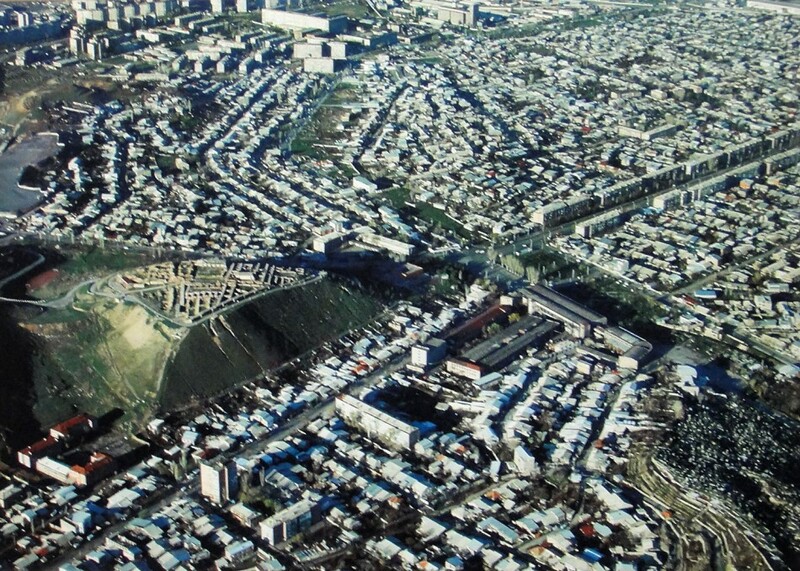 The Urartian stronghold of Erebuni, as seen from the south, i.e. the opposite side to the modern town. Are the Urartu proto-Armenians? Who are the Armenians? A favourite answer is that the Armenians are the descendant of the Urartu, who flourished in Armenia from 950 to 650 BC and who were the first literate people in Armenia: this is when Armenia formally enters history. The capital of the Urartu was the city of Van which they called Tushpa, today in the middle of eastern Turkey. 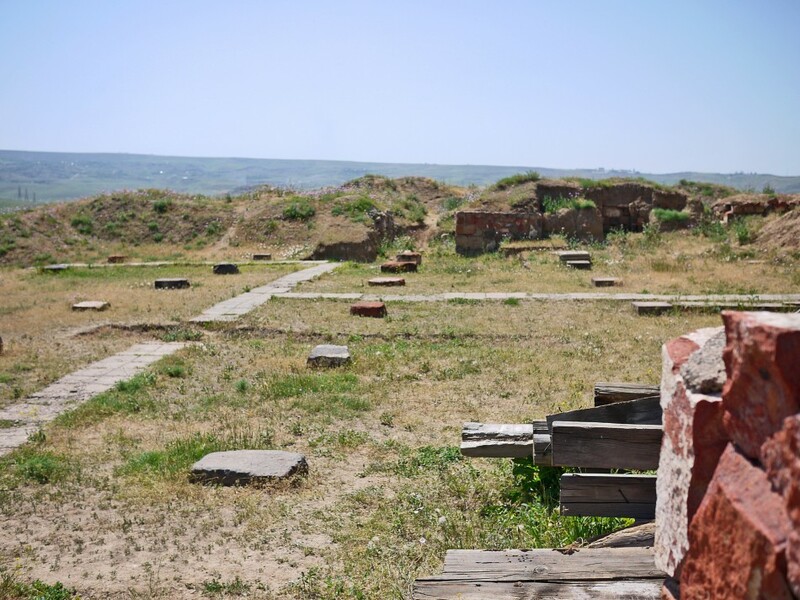 However the two best preserved and explored towns of the Urartu, Erebuni and Kharmir Blur are in modern Armenia, in the suburbs of Yerevan But to understand the Armenians, we must first take a quick look at the history of the Urartu. 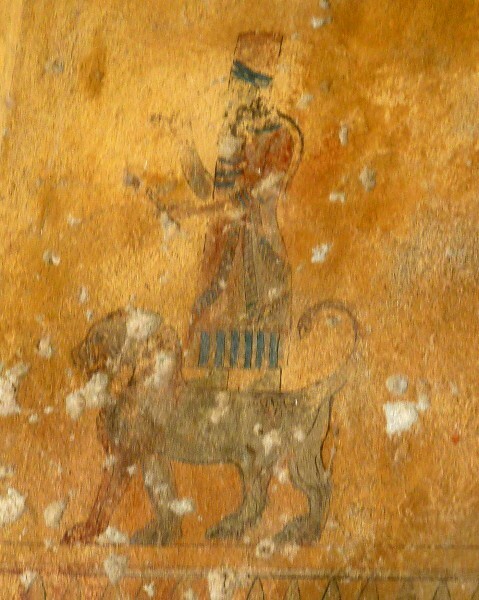 The Urartu were contemporaries of the Assyrians, or rather they were enemies of the Assyrians, who considered them to be wild mountainous barbarians living to the north, who flourished when Assyria was weak, but who were conquered when Assyria was strong. But the Urartu were literate, they had a language all of their own, which they wrote in cuneiform which makes it easy to transcribe by anyone who knows cuneiform, and therefore we have three sources of information about the Urartu – from their own inscriptions, from the inscriptions of the Assyrians, and from archaeology, particularly the excavations of the two major sites in modern Armenia: Erebuni and Karmir Blur.The Urartu were first discovered in 1827 by the German archaeologist Friedrich Schultz working for the French Asiatic Society. He went to Van where he described an ancient site on a rock outside the modern town, and transcribed some interesting inscriptions. Van was in fact the capital of the Urartu and known by them as Tushpa. Lake Van lies geographically at the centre of Greater Armenia. It is a lake that has no outlet, lying in the hollow of surrounding mountains. Go up and over the mountains to the west and you come to the headwaters of the Euphrates. Go up and over the mountains to the south and you come to the headwaters of the Tigris. To the east is the Araxes and to the north the Kura – two rivers which eventually join up together and flow out into the Caspian. Thus Van is at the centre of the mountainous upland region which forms Greater Armenia.The next big recognition of the Urartu came in the 1880s when the linguists who were sorting out cuneiform recognised various additional languages to Assyrian. 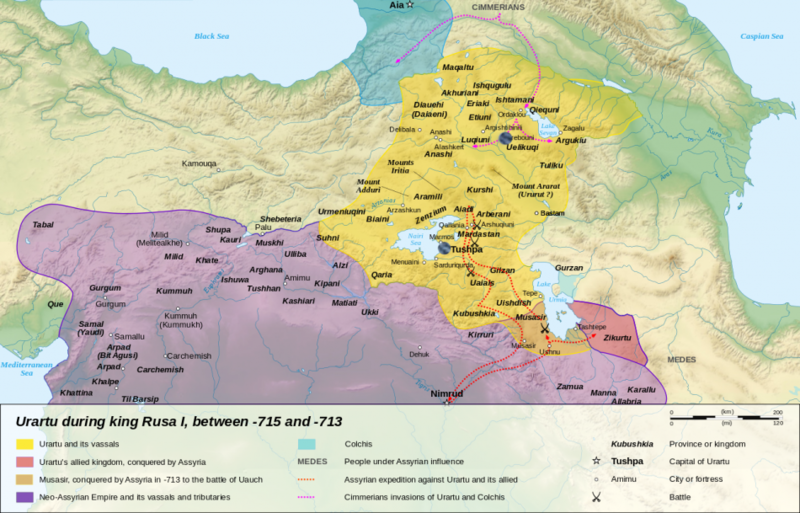 The most important turned out to be Hittite – a very major empire unknown up to that time. But another language turned out to be Urartian, though this was not properly elucidated until the discovery of a bilingual inscription at Kelisin (or Kelashin), which had been discovered in 1823, though the discoverer was murdered the following year – archaeology was a dangerous occupation in those days – and so the inscription was not properly recorded until the 1920s.By putting together the Assyrian records and the Urartian records, with a little help from archaeology, a history of the Urartu can be concocted. They are first recognised probably in around 1300 BC in an inscription of Shalmaneser I, when they appear as a confederation of minor states rather than a single unity. The first recorded king, Sardui, comes in the 9th century, but ironically the best known early record is of a major defeat by the Assyrians who recorded their victory on some huge gates at Balawat covered with bronze plaques. 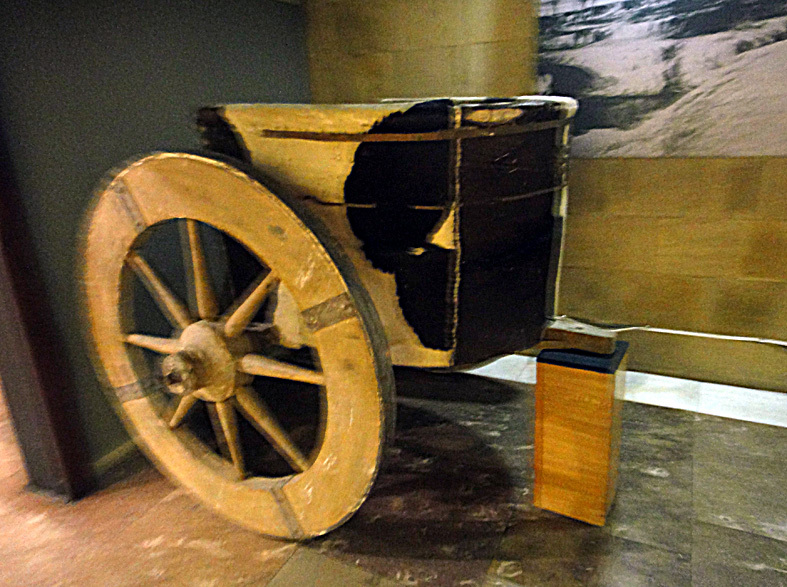 The first of these were discovered by a Turkish archaeologist working for the British Museum in the 1880s, and brought back to the British Museum and stored unseen in the basement until a century later, when they were rediscovered and studied and wooden gates were built to host them: they are now one of the prime exhibits at the entrance to the Assyrian galleries. But they show in considerable detail the capture of Urartian towns: take a look next time you are in the BM. (Another set was also excavated by Max Mallowan in 1956 and placed in the Mosul Museum, where they have been looted in the recent troubles).But in the 8th century Urartu rose to prominence, notably under its great king Argushti who Wikipedia dates from 810 to 786. 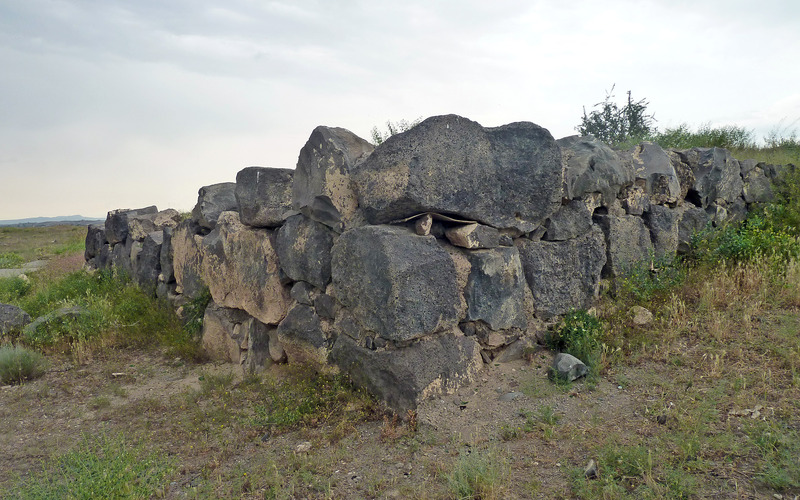 He built walls around Tushpa (Van) and also established a new town at Erebuni in 782 – the foundation inscription still survives. 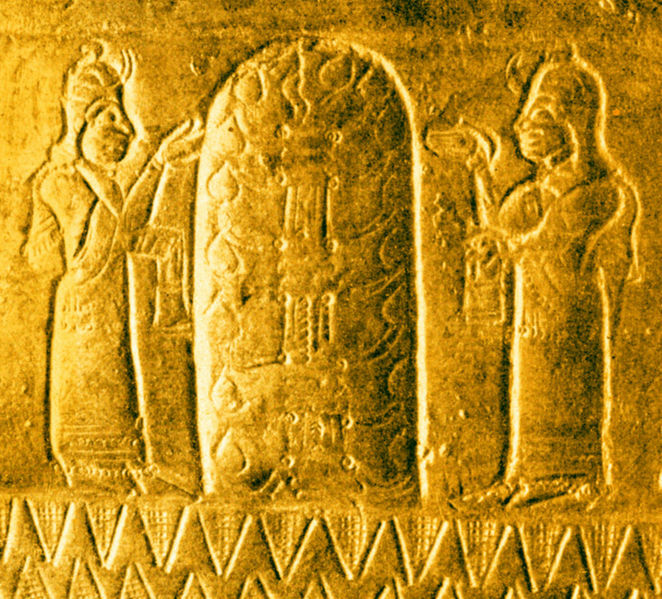 In modern Armenia, there are two excavated sites which provide much of our information about the Urartu. 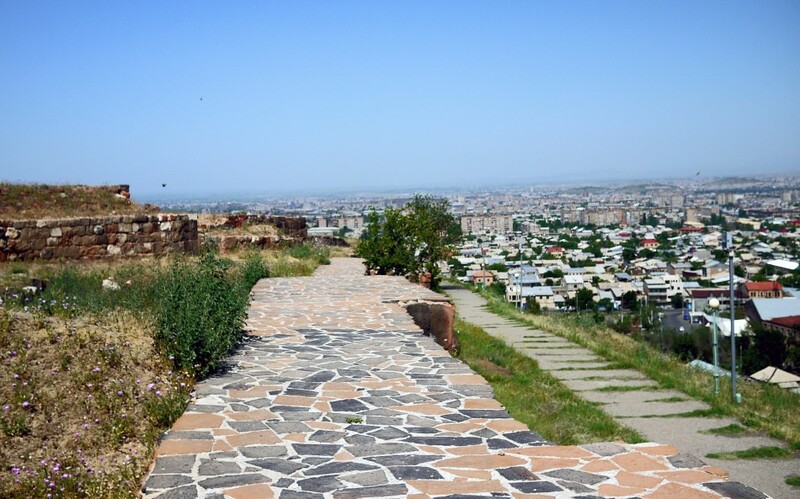 Both lie on the outskirts of Yerevan: the better known, but probably originally the less important is Erebuni, for Erebuni is the one that has been turned into a grand visitor display. 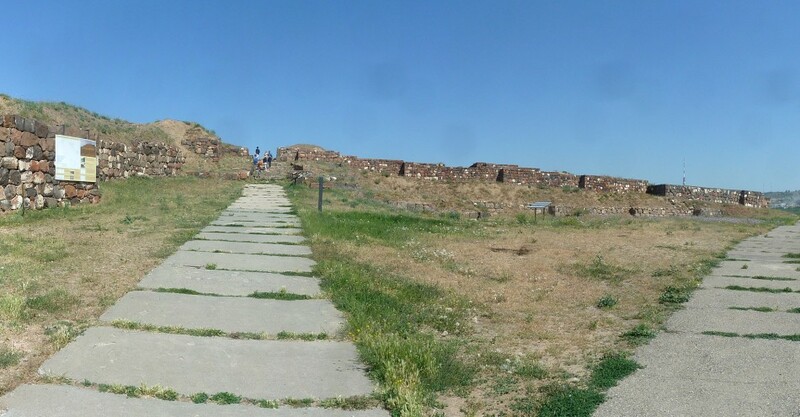 It lies at the end of a splendid avenue – Soviet planning at its most grandiloquent, which leads up to a large museum with finds from both sites, with a long stairway to the fort above. 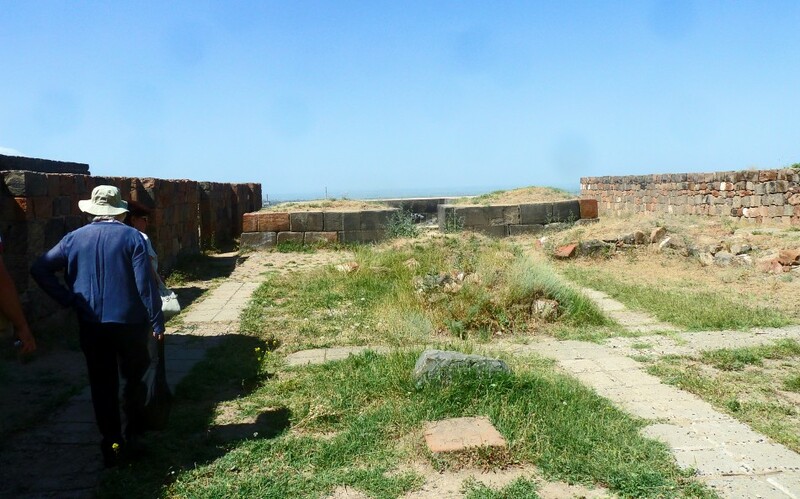 Though for buses and privileged visitors there is a road round the back which leads up to the top (see header) , where the whole palace has been restored, with the walls rebuilt three feet high. In the subsequent Persian era, the Palace was substantially rebuilt, and it is a little difficult to know how much of the restoration belongs to the subsequent Persian palace. Indeed, it continued to be occupied to some extent throughout the Middle Ages, and the people of Yerevan would like to believe that the name Yerevan is actually derived from Erebuni. When one approaches the site, the defences are impressive. There is only one entrance, to the south, where a V-shaped enclosure leads to the only gate. Once inside the gate was a large open space filled with column bases, which is an apadana, a Persian columned hall. This would have been the main ceremonial entrance hall to a Persian palace. Was this part of the original Urartian palace, or is this a later addition, made when this became a Persian palace? On the south side of the Apadana is a low mound, which is said to be the base of a mini ziggurat. Is this, again, a later Persian addition? The plan of the palace. The entrance is to the bottom right, by the red arrow.This leads in to the ceremonial area, in blue, with the palace in red beyond, and the servants quarters in yellow to the right. 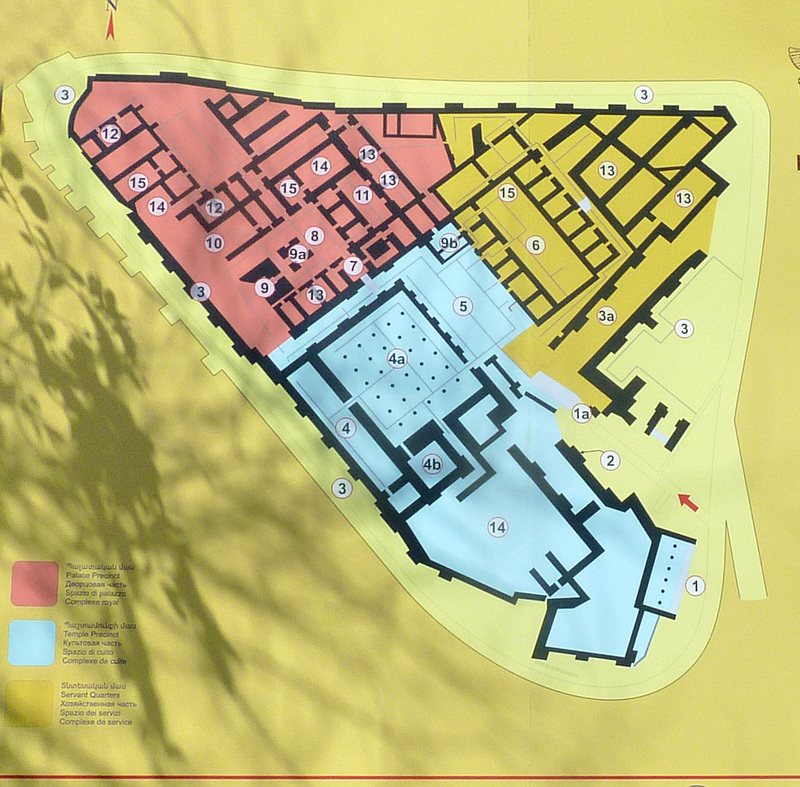 In the ceremonial area( blue), the most important building is the Apadana (4a), while 4b is the mini ziggurat. The Palace area (red) is a rabbit warren of small buildings, but (9) and (9a) are the two Fire Temples. In the servants quarters (yellow), structure 6 when excavated was a storage area of the Persian period, but it may have been the major ceremonial hall of the Uratian era. The Entrance to Palace, as restored. The actual palace was, as so often rather unimpressive, a rabbit warren of small rooms. Temple courtyard. 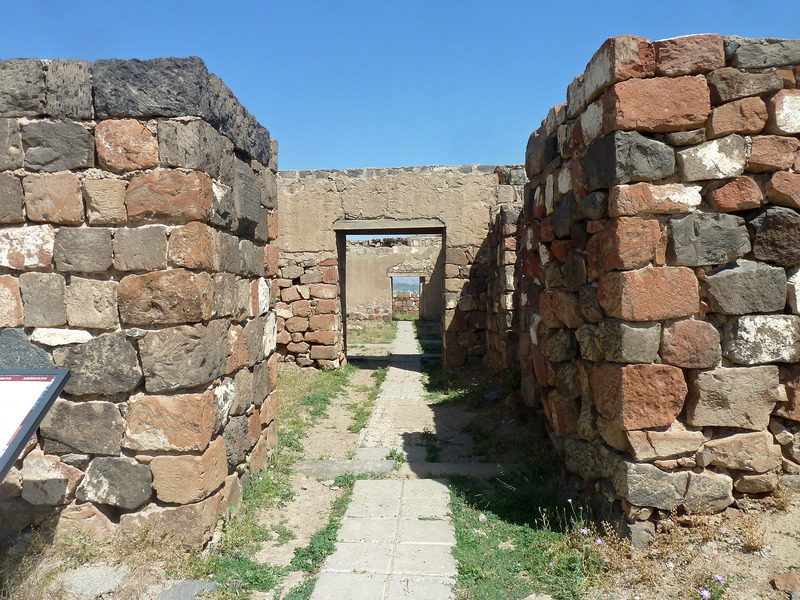 At the heart of the palace were two temples: one dedicated to the god Susi, and behind it a fire temple of Zoroastrian type. Both have thick foundations, so they may have been tall towers. At the heart of the palace were two temples: one dedicated to the god Susi (9) and behind it a fire temple (9a) of Zoroastrian type. Both have thick foundations, so they may have been tall towers. At either side of the entrance to the temple to Susi are inscriptions in cuneiform writing, still preserved on either side of the doorway. 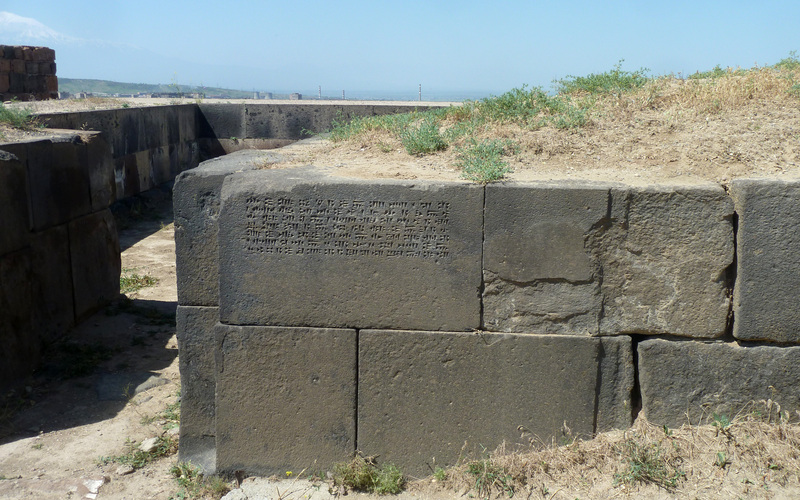 It reads:“Argishti, son of Menua built this temple to the god Ivarsha. Argishti says the land was desert, nothing there was built. Argishti is a mighty king, a great king, King of the land of Biainili (Urartu) ruler of the city of Tushpa (Urartu’s capital)”. 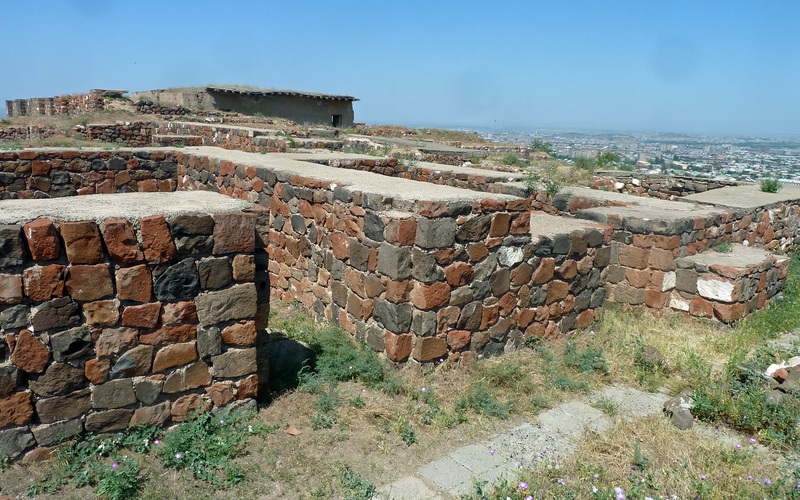 Argishti (786-64 BC) appears to have been the most successful of the Urartian kings who founded Erebuni on a virgin site – as he says, the land was desert and nothing there was built. But it is clear that this is a typical palace of a gift exchange economy with large numbers of granaries and storage rooms for containers for the staples of Middle Eastern wealth. There is no sign of any market place or of any big audience chamber. The defensive wall that surrounded the city had was of ‘casemate’ form, with in/out projections. 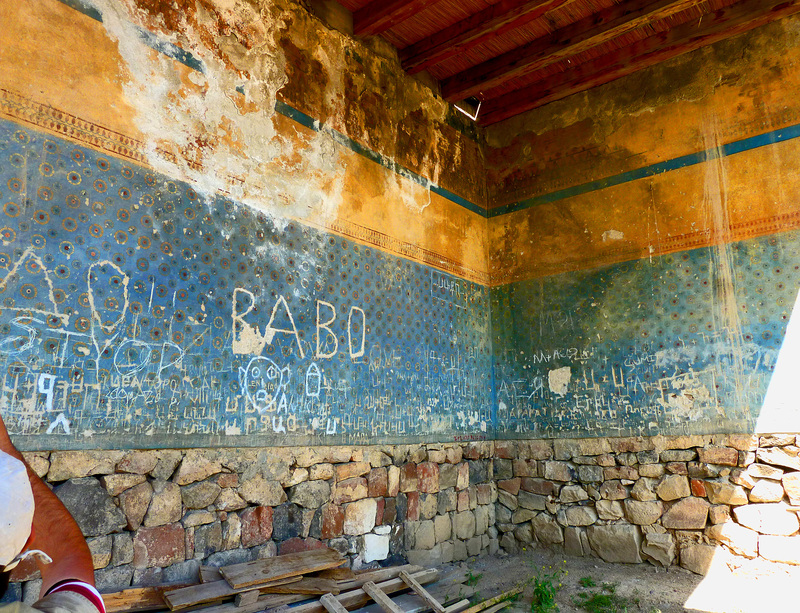 The palace was magnificently decorated, and in one corner enough remained for a whole wall to be reconstructed with the original decorations, mostly with a blue background with stars on it and with a dado above covered with lively figured scenes. Sadly it has now been wrecked by graffiti. It is perhaps a little unfair to show this picture of the reconstruction wrecked by graffiti (interestingly in the Roman script rather than the Armenian script). Water leaking from the roof has played havoc with the top half of the reconstruction, but it still nevertheless gives some idea of the original splendour of the rooms (see details below). 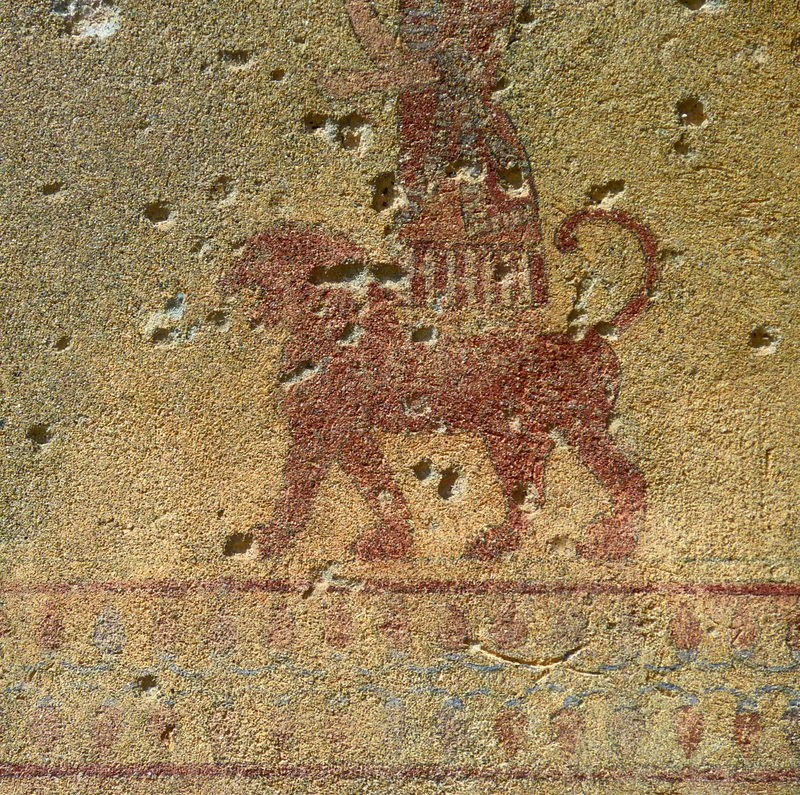 Some of the original paintings in the upper part of the wall still survives (see right).Both photos show the same image of a figure of the god Haldi riding on a lion. 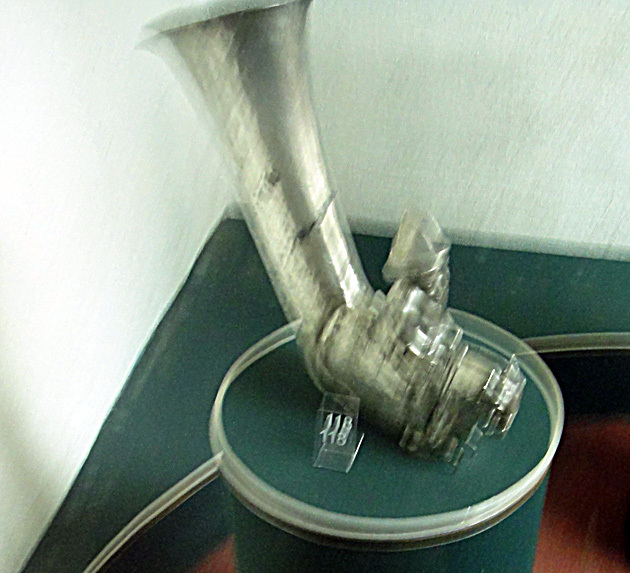 The extensive site museum contains many of the finds from the site and also from the neighbouring site of Kharmir Blur.Here we see a rhyton, or drinking horn (sadly not in focus) and far right a chariot with spoked wheels. 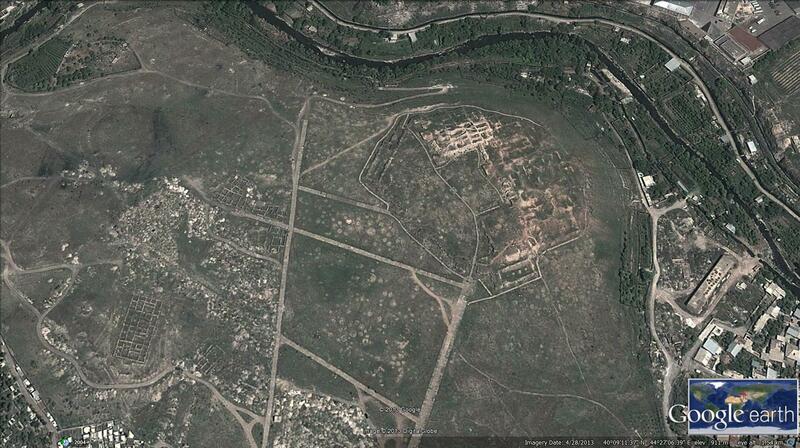 But Erebani was not the only Uratian town in this rich corner of Armenian territory. 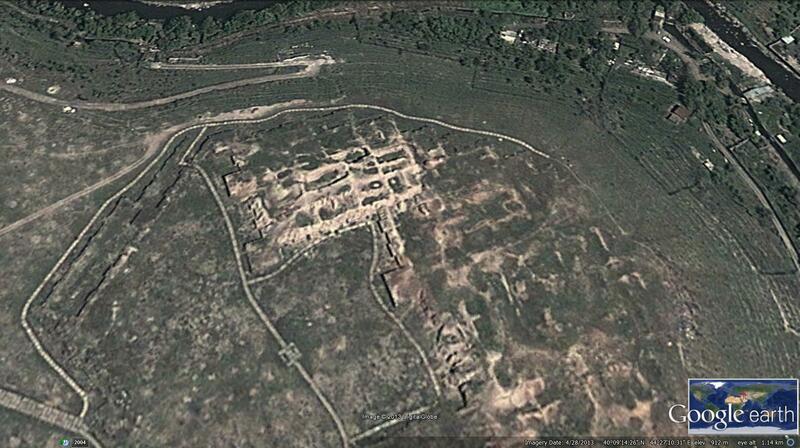 This splendid Google earth photo reveals the full extent of the Teishibaini palace and town. Start by noting the river Hrazan which curls round the top right hand corner. Then in the curve of the river are the excavated remains of the palace on top of a steep hill. 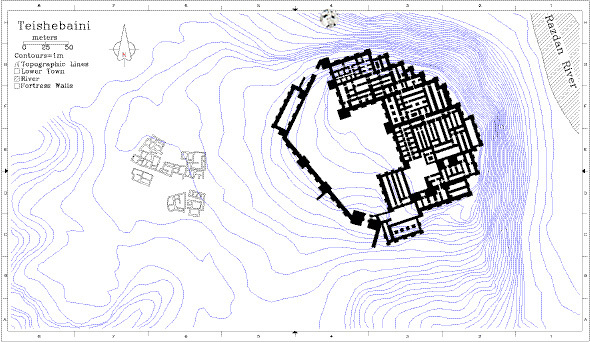 Then note bottom left the excavated layout of one of the blocks of the town. Then note in the centre some more irregular rectangular buildings. Then go on to explore other parts of the town. But this gives a very good impression that it was not just a palace – the palace merely is a small part of a very extensive town. Detailed Google earth view of the palace and below a plan of the palace and the nearer part of the town buildings which I found on the web courtesy of University of Chicago. Piotrovsky was an energetic excavator who uncovered not only the walls but also a palace with 120 rooms spreading across more than ten acres. A cuneiform inscription found in 1936 mentions Rusa, son of Argishti, who is Rusa II. And a later inscription calls it the ‘city of Teisheba’ who was the god of war. The Hermitage Museum website tells us that the fortress received tribute in the form of food stuffs collected from the tribes of Transcaucausia. Buildings were discovered intended for the production of sesame oil with heaps of oil cake waste. There was also a workshop for the brewing of beer and a storeroom for grain, where large quantities of barley, wheat, millet and flour were kept. 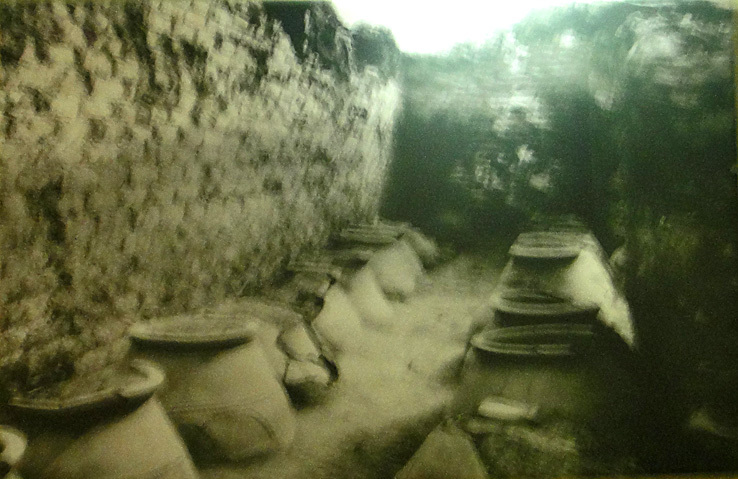 There were also enormous wine cellars with huge vessels half buried in the earthen floor. It is reckoned that more than 400,000 litres of wine could be kept in these vessels. 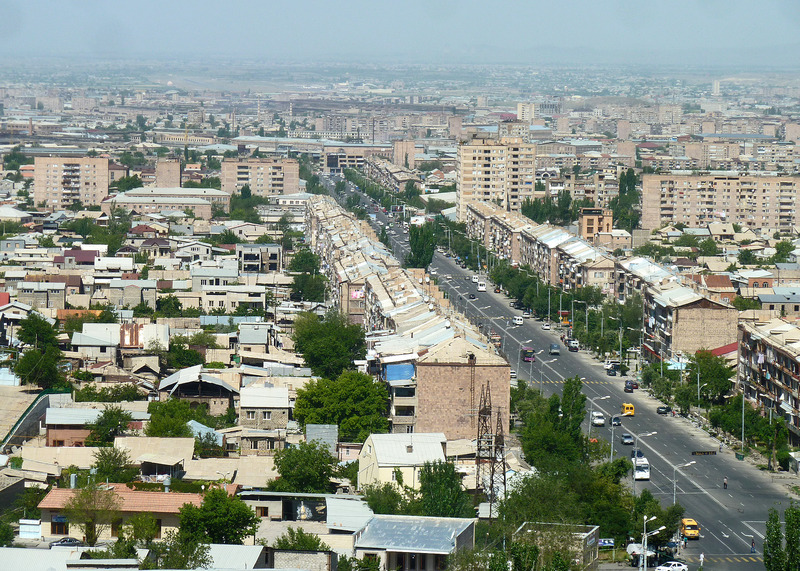 We were not able to get up to the palace site due to a thunder storm but I have found this photo on Wikipedia with the town of Yerevan in the distance. Note what I assume is a very cleaver example of conservation where the walls have covered with piles of soil in order to conserve them.
. During the assault, fire broke out and buildings collapsed in the flames, buring beneath then people and various objects. The burning was so fierce that it coloured the rocks red, which is why Kharmir Blur means the red city. However it is often called by the Urartian name of Teishebaini – city of the god of War. This is my photo showing a gateway through the defences. We got this far and I took this photo, then the heavens opened and there was an enormous thunderstorm and we got soaked through to the skin. I concentrated on keeping my camera dry! This is the best discovery of the Piotrovsky excavations: part of a helmet showing the Tree of Life at the centre with two worshippers on either side. .The inscribed helmet of the Emperor Sarduris II is especially noteworthy. The inscription reads”to the god Khaldis, the protector of Sarduris, from the son of Argistis for his life’s sake”. 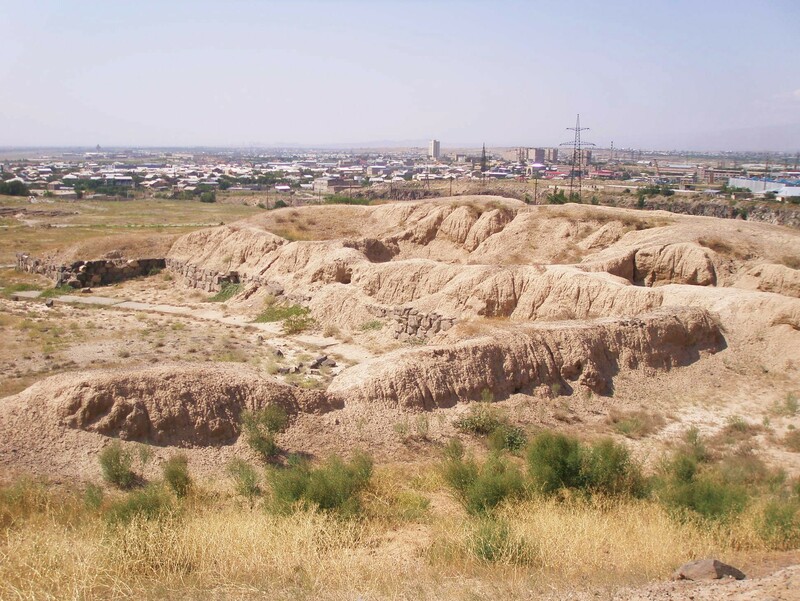 Excavations are about to resume, which should restore Kharmir Blur to its rightful place as being the other major city of the Urartu in modern Armenia.